Institut Karité has released a hair butter in the most beautiful packaging you could imagine. It is closed in a metal jar in the colour of fuchsia with a picture of garden of Eden. 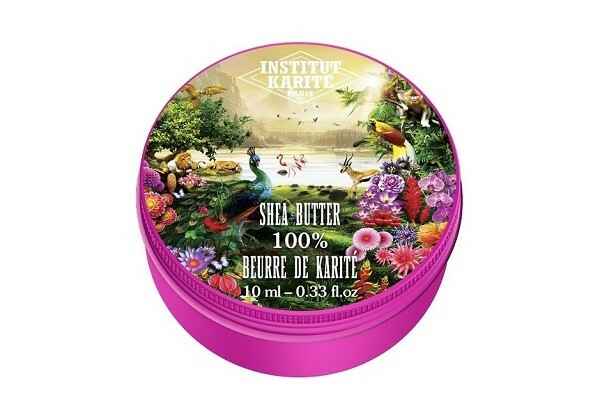 The packaging is in a retro style and in this matter, Institut Karité Paris Jungle Paradise outclasses all other butters available on the market. The product comes in three different containers of different capacity: small jar 10 ml, medium (50 ml) and a large one 165 ml. The components of the product are no secret. It is pure, 100% shea butter. Thick and with beautiful scent (the butter has nutty-wooden, very pleasant scent). It can be used for both care and styling hair as well as a balm or a cream for over-dried parts of of the skin or face (10 ml version will be perfect as an under eye cream or lip balm). Butter can be a special serum that will protect hair ends from damages and over-drying. Shea butter applied to hair, regenerates and nourishes it. Thanks to the content of vitamins A and E, it slows down the processes of hair ageing. Moreover, the product protects strands from the damaging effects of weather conditions, toxins from the environment, mechanical damage. The good news is that she abutter does not cause any allergic reactions and sooth irritations. Therefore, wisps become smooth, resilient and shiny. Moreover, shea butter works perfectly as a hair mask, especially for people with sensitive scalp. It does not contain any artificial, chemical substances. Shea butter is suitable for the care of the whole body; regenerates even the most over-dried skin areas. However, its main task is to take care of your hair. The content of fatty acids makes it a product suitable for both low porosity hair, as well as those of medium porosity. As a no-rinse conditioner for dry hair – in the form of butter it works as a product that tame unruly strands – make sure to use very faint amount of it. Shea butter is a versatile product, safe even for people with very sensitive skin. It is suitable for people who have low and medium porosity hair. Additionally, the product promoted by the Institut Karité is also beautifully designed and will decorate your bathroom. A Sensational and versatile product you can trust.